Come to Me, all you who labor and are heavy laden, and I will give you rest. 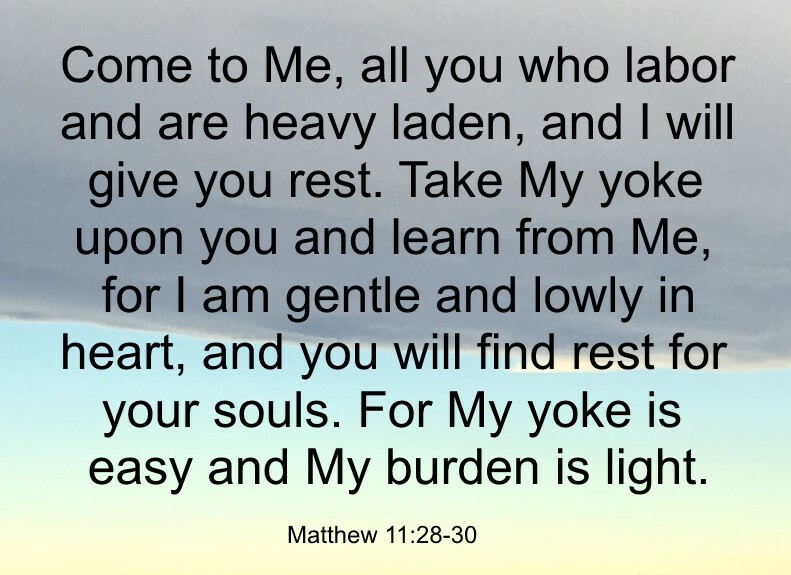 Take My yoke upon you and learn from Me, for I am gentle and lowly in heart, and you will find rest for your souls. For My yoke is easy and My burden is light (Matthew 11:28-30 NKJV). Six days may work be done; but in the seventh is the sabbath of rest, holy to the LORD: whosoever doeth any work in the sabbath day, he shall surely be put to death. Wherefore the children of Israel shall keep the sabbath, to observe the sabbath throughout their generations, for a perpetual covenant (Exodus 31:15-16). For with stammering lips and another tongue will he speak to this people. 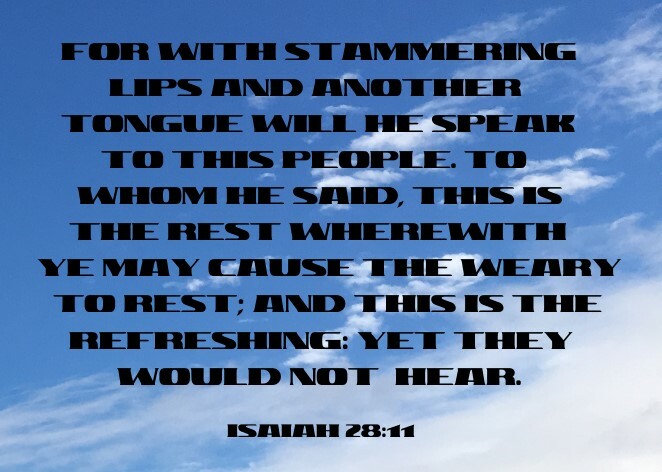 To whom he said, This is the rest wherewith ye may cause the weary to rest; and this is the refreshing: yet they would not hear (Isaiah 28:11). In the law it is written, With men of other tongues and other lips will I speak unto this people; and yet for all that will they not hear me, saith the Lord (1 Corinthians 14:21). For this to happen though, God had to reveal Himself in the flesh as Jesus Christ (1 Timothy 3:16, John 1:1,14), then be crucified, be buried and rise from the dead (the Gospel of Jesus Christ - 1 Corinthians 15:1-4). Why do I say that? Because Jesus said that He must depart so He could send the Comforter (John 16:7), which is the Holy Ghost (John 14:26), in His name. Just before the Risen Lord ascended to heaven, He told His followers to go to Jerusalem and wait for the Holy Ghost (Acts 1:5,8). One hundred and twenty souls did exactly that (Acts 1:15) including Mary, the mother of Jesus (Acts 1:14). Then on the day of Pentecost, they were filled with the Holy Ghost, and spoke in tongues as the Spirit gave utterance (Acts 2:4). So just as Isaiah prophesied, these Jews spoke in a new tongue. Jesus said they would as well just before He ascended to heaven (Mark 16:17). By the end of that day there were about another three thousand that were added to them (Acts 2:41). Going back to the opening scripture (Matthew 11:28-30 NKJV), Jesus said that He will give us rest. When we are filled with the Holy Ghost, with the evidence speaking in tongues, we have Jesus living in the inside of us, exactly the same as the Holy Ghost living in the inside of us. This is an important Biblical concept to grasp. Jesus is the Holy Ghost. Spirit that dwells in you (Romans 8:11). who hath also given unto us his Holy Spirit (1 Thessalonians 4:8). Were you able to? I certainly could not. Jesus is God! He is the Father, He is the Son and He is the Holy Ghost, and all these three are one (1 John 5:7, John 1:1 and John 1:14). For anyone who is born again, we rest in Jesus every single day, every single hour and every single minute of our lives. Hallelujah! 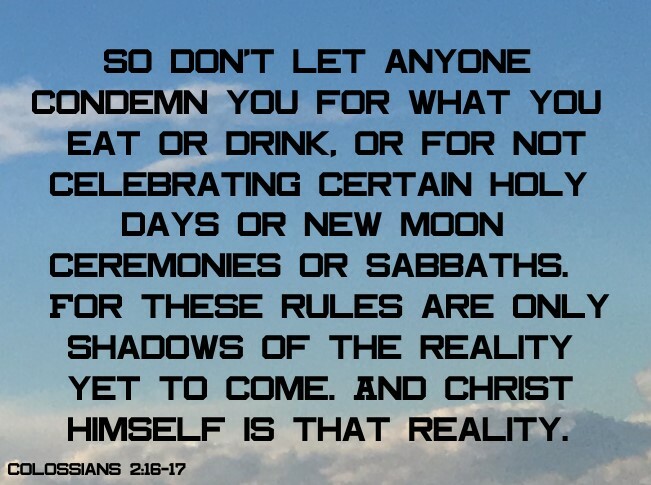 So don’t let anyone condemn you for what you eat or drink, or for not celebrating certain holy days or new moon ceremonies or Sabbaths. For these rules are only shadows of the reality yet to come. And Christ himself is that reality (Colossians 2:16-17 NLT). Clearly the Sabbath, was only a shadow, a type of the reality of Jesus Christ, our real rest, the only rest we need.